Here I will document the parts list and build guide for all BLM users. Once there's a bit more knowledge a wiki page could also be written. 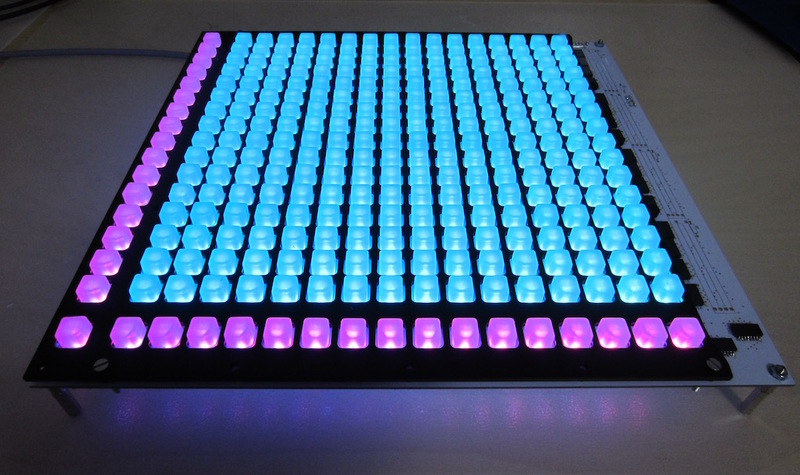 You can choose whether you go for Blue+Green LEDs (recommended) or Blue+Red. You could interchange some Green for Red. Green+Red is not recommended as the colour mixing is poor. Slider height: I specified 15mm shaft sliders, you could change these for 10mm. 15mm will protrude 13mm out of the case, which might be a bit long. 10mm will only protrude 8mm, so they would be less likely to break off and will probably be a bit more sturdy. TK. suggests 1k should work, the others are too high in resistance to get good jitter-free values. You should use the indicated panel mount DIN, but a cheaper pair of DIN8 plugs might work. 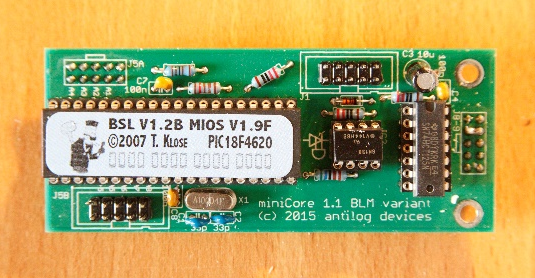 M2 hardware is a bit difficult to find in normal stores, but Boltbase on eBay has good deals. The BLM is not particularly difficult to build but there is quite a bit of repetition. I advise to complete one section at a time before moving on. 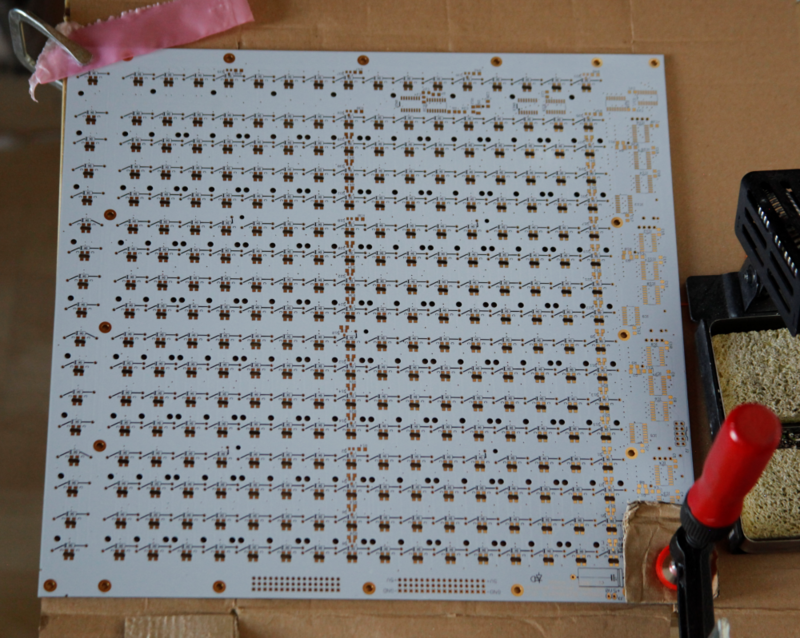 First up, there are 289 through-hole diodes on this board. It might be smart to get all diodes pre-bent and trimmed before doing anything else. 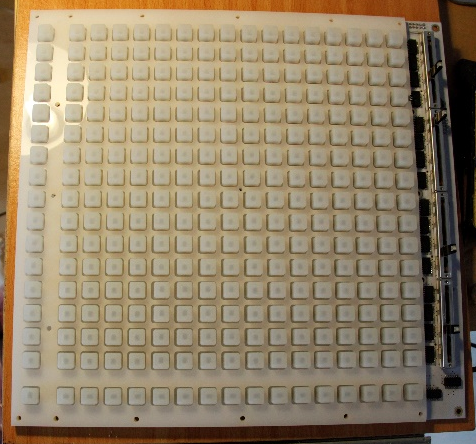 The legs should be cut as short as possible before soldering otherwise the button pads won’t sit flush. If you cut the diode leads they tend to fall out; this can be a bit frustrating. Some diodes also overlap with the transistors, make sure they don’t electrically short. So you may wish to solder all of the transistors first, followed by the diodes. Read on for suggestions on mounting these. The down side with this way would be that it’s easiest to put the LEDs in when there’s nothing else on the board… please have a go and share your experiences. I suggest that the PCB is initially clamped (using a scrap piece of material to protect it from the clamp) to the work space, otherwise your parts may jump around if the board gets bumped. If it is truly flush with your bench it will also help to keep the diodes/solder from going through the plated holes. Try to protect the exposed button pads on the PCB top by using a piece of clean paper or other material; don’t damage the surface by scratching it. LEDs are a little bit sensitive; don’t heat them for more than about 2 seconds at a time and apparently they don’t like static discharges... As far as I know, the humidity warnings you get with them are only really applicable to oven reflow soldering. First up you should tin the pads on the rear side only. I recommend clamping the board at a right angle so you can easily go down a “row.” Tin at least the LED anodes (just the top pad! ), but you could do one pad of every SMD component (over a few days it will get harder to “wet” the solder as it oxidises). 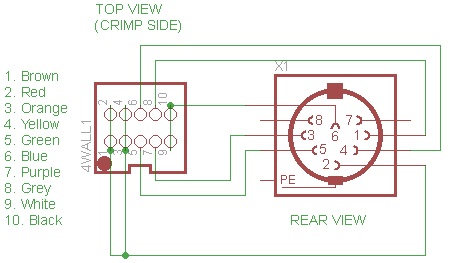 It will be easier to “tack solder” if you choose a pad which isn’t part of the ground plane. Avoid pre-tinning pads with thermally isolated connections to ground. Actually left on the PCB rear. Ensure the “C” symbol is oriented with the PCB silkscreen. Or you can think of it as making a “T” when the board is viewed the correct way up. Actually right on the PCB rear. Once these are placed you can go back and finish all of the cathodes, also touching up the anodes if needed. Located near header J1. These are pretty tricky, so go slowly and use as little solder as possible. Clean up with braid if needed. Orientation is fixed, again don’t overheat them! Note the line of transistors down the centre of the board (when viewed from the back), another at the left plus 4 more along the bottom. This BLM has a small issue with ghosting (some LEDs are dimly lit when they aren't supposed to be). A fix involves soldering a BAT54 diode 1:1 on top of the transistor, this is hard to photograph but if the solder blobs are big enough they will span from the SMD pads all the way up to the BAT54. Not so big that they short out the two adjacent transistor pins! You may want to see if you are happy with the ghosting before applying this fix; it's only noticeable in complete darkness. Some silkscreen values are missing, sorry about that! They are located next to each BC818 transistor (+BAT54). Don’t worry if solder bridges form from the resistor to the transistors, the pads are common. But don't short out both ends of the resistor! 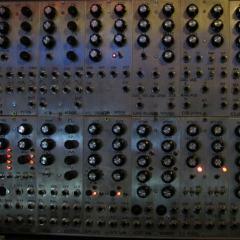 These form the 4 power on delay circuits located at the left, plus one on the bottom. They are polarised with the black band oriented towards the silkscreen corner line. Orientation is very important with the grey band towards the silkscreen corner line and + symbol. TANTS MAY CATCH FIRE/EXPLODE IF MOUNTED INCORRECTLY! Located next to each IC. Note C26/C27 and R6/R7 don’t need to be installed unless you want to terminate the SC/RC lines, it works fine for me without these. The other way is to place all the diodes without trimming (making use of spacers attached to the PCB corners), then chop the leads. If you do this they have a tendency to fall out when you flip the board, but it works. Similarly they MUST be soldered from the rear i.e. 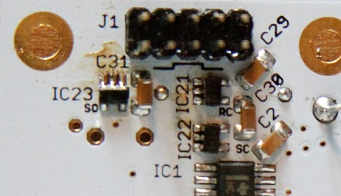 the same side as the component is placed. Be careful with diodes that are placed over a transistor or one of the few that have their legs bent out of the way to avoid a mounting hole, they need slightly different lead lengths. Note that these are POLARISED according to the silk screen. You can follow the silkscreen but it doesn't matter here. 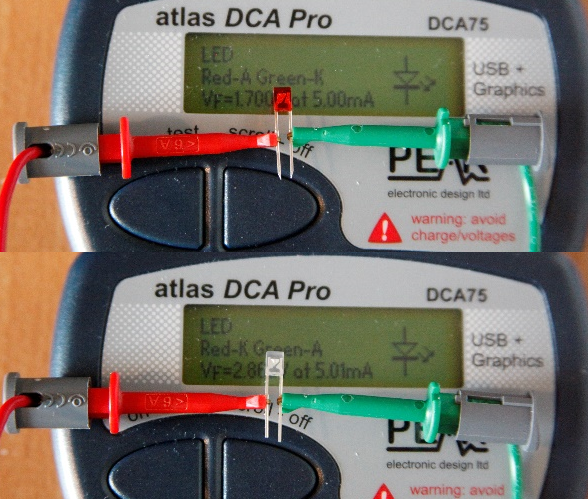 if using blue LEDs for colour 1.
if using green LEDs for colour 2, also for red LEDs. The “minus” end is marked with an arrow, the “plus” end has an indent aligned with the silkscreen. Sliders are 60mm long and spaced 60mm apart, so they fit together exactly. Mount all 4, then start by soldering one leg. Check the slider is absolutely flush against the PCB before continuing with the remaining legs. Please bridge R1 with a piece of wire. Then solder the 2x5 DIL headers. Now you can apply power to the board (either through J1 or J3) to check the LEDs and choose the through hole resistors that set the LED sliders’ brightness. 10k was good for me. Note: please don’t send clocks/serial data to the BLM with the board’s power disconnected, it might damage the CMOS. 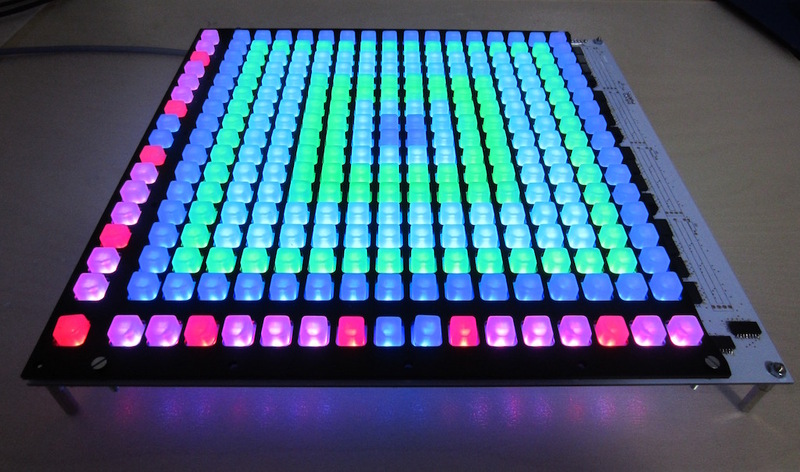 If a Core/miniCore module is connected then without MIDI input the LEDs should light with each button press (just use a loose button pad) in sequence: LED1, LED2, LED1+2, and off again. Crimp a 10 pin IDC connector on about 40 cm of ribbon. 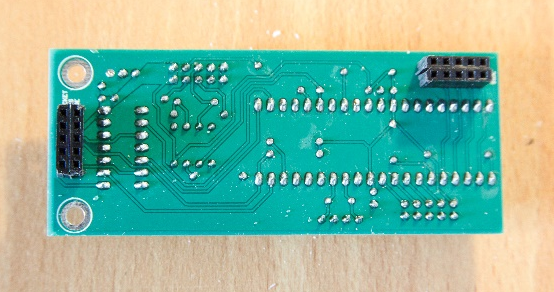 Then solder the following pins on the DIN8 socket in order. It should be possible to do this outside the case and thread the IDC through the mounting hole. Thereafter a DIN8 cable can connect to the corresponding SEQ BLM connector, but you may want to wait to install everything together in the case. 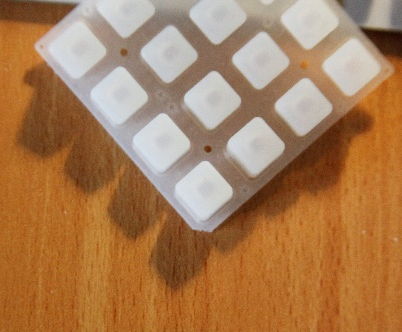 Carefully cut 16 pieces of 1x4 buttons ensuring each has the two guide nubs at the bottom. I recommend scissors instead of a knife to keep it tidier as the silicone tends to unhelpfully flex under a knife. Also cut the corners off pads where M2 grub screws will enter from the front. 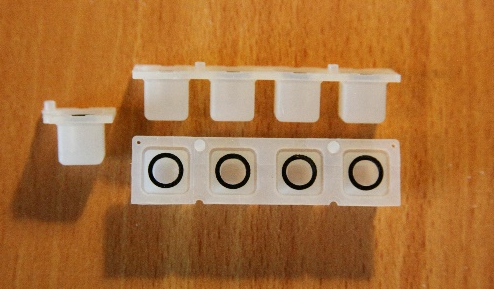 Now the button pads may be placed (oriented so the nubs fit in the correct PCB holes). It’s best to go from one side to the other to keep everything flat. Then place the acrylic spacer on top (mine is a bit different). There are extra rings of acrylic which can be used as “washers” to make up for the top and bottom right corners. You might want to add thinner metal washers as well to get the distance right. When ordering the spacer (e.g. from Formulor or Ponoko) make sure to choose opaque acrylic in 3mm thickness, probably white or black is best. If you buy milky or clear plastic some LED bleed might occur. Lift the PCB into the case from the bottom (so your 289 buttons don't fall off) and loosely attach at least a few corners with M3 nuts. You need at least the centre M2 grub screw and can add the other four M2 screws if you feel more stability is needed. It’s probably best to thread them through the PCB from the rear; be careful as the thread pitch is quite fine (0.4 mm) and is cut into soft aluminium. I haven’t noticed any unscrewing, but you could add a drop of Loctite to be sure. Two M3x12 MF spacers attach on the top left corner (viewed from the back), this is where the miniCore will go. Next tighten the remaining nuts evenly; don’t overtighten as the PCB will flex! As long as the button pads were placed more or less in the right place they should sit evenly above the front panel. Or they may require reseating to get things even. Attach the miniCore module and a ribbon connector to J1 and panel mount the DIN socket. You need to jumper 4 unused AINs on the miniCore's J5B to ground which will prevent noise on these inputs. Then close up the case, attach the bottom feet and you’re done! Congrats on finishing your BLM and I hope you enjoy using it! I (or somebody else) will likely design a protection circuit so the extra AINs (4 available) can be used to control parameters on the SEQ. Modular voltage levels are NOT RECOMMENDED without this protection as outside the 0-5V range they will damage the PIC. Nothing too special here, just remember to mount the resistors first (i.e. before the DIP40 socket). 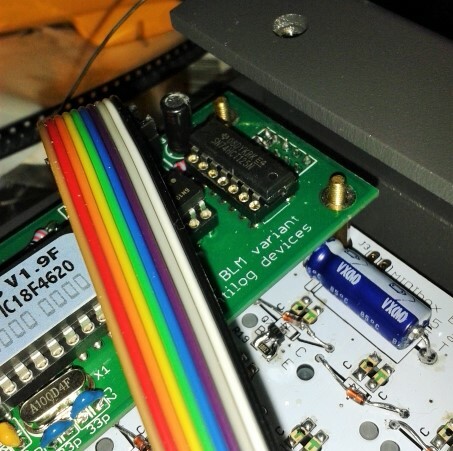 The BLM data lines are buffered on the main PCB so potentially the 74HC125 chip could be left out. Also keep in mind that the female DIL header sockets must mount on the rear of the board. You can see that I made do with SIL versions that I cut into rows of five. Note: you can also use a PIC18F4685, currently stocked by SmashTV. ---                   1         PIC18F4620 from smashTV or other suppliers. Needs MBHP bootloader flashed. Otherwise PIC could be reset sporadically (depending on the number of enabled LEDs) because the voltage level could fall below 4.5V! This change is only required for PIC18F452, other pics (such as PIC18F4620 and PIC18F4685 will work w/o this change). Unfortunately this change can only be done with a PIC programmer. Please contact TK. if you don't own a PIC programmer. He could send you a replacement PIC18F452. Alternatively use a PIC18F4620 or PIC18F4685 if you own one. Many thanks to TK. for a great concept to begin with and for providing firmware support to get my kludged prototype working. And to all builders: thanks for trusting me, it's not too cheap for DIY but I hope you agree the end product is worth it. It seems like some form of local power regulation is needed to ensure stable operation. As noted above, some PICs have brown-out detection built into the bootloader, so when many LEDs are lit, the PIC resets and won't work until the voltage rail stabilises over +4.5V. The simplest way I found was to interrupt the 5V line after the DIN socket (inside the BLM case) and add an adafruit Verter Buck Boost regulator. 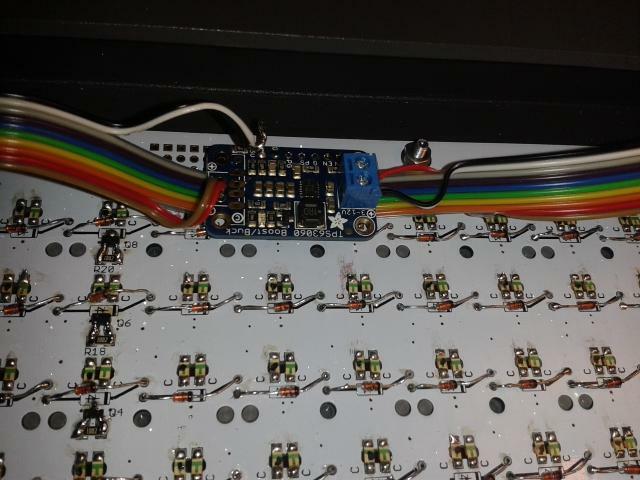 Mounting is stable using a SIL header on one row of the blank muck space, this can be connected to the unused functions on the small PCB. Using the Verter, standby voltage and current is 5.2V and about 30-60mA. With all LEDs lit (both colours) the draw goes up to 647mA, although this would never be done in normal operation. In track mode with all 16x16 blue LEDs lit the draw is 467mA and the voltage drops to 4.72V. I don't really perceive a difference in brightness, but it could only be a good thing! As long as the ADC inputs are scanned relative to the supply voltage you shouldn't lose control at the top end. Very nice to build, no big troubleshooting required if you are careful enough and don't forget a solder joint or create an unintended short. Andy deserves great respect for his sophisticated design, this is really professional work and sets a new DIY standard! 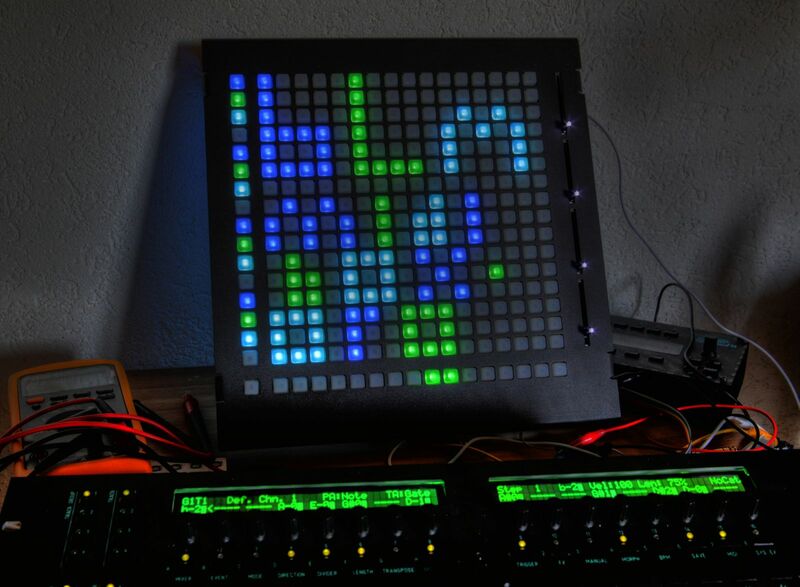 Although the BLM16x16+X project is 5 years old meanwhile, you still can't buy a device with 290 buttons and duo-colour LEDs - you can only build it by yourself - and it has never been easier! Beautiful work, lovely colours! I'll try to find a source for 10mm sliders in 5k. How many hours did the build take? TK open the way... let's go! i waiting for mouser ,i take blue and green leds but i don't believe in this colors...let's see...what happens...in reality! It took me around two days (ca. 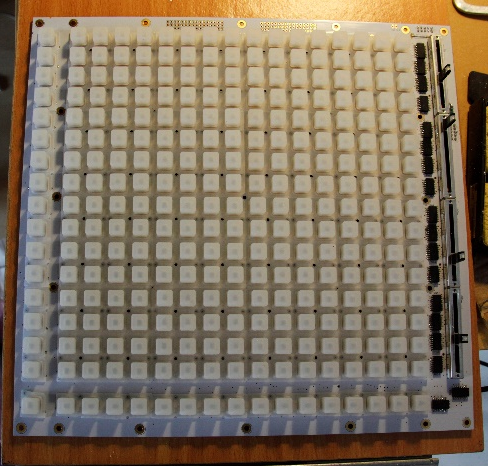 15 hours) - at the first day I soldered 1N4148 diodes and LEDs, and at the second day the remaining parts. Over time I became faster with SMD soldering, but still ensured that parts are correctly aligned - especially for the LEDs it's important that they sit flat on the PCB, otherwise later they could illuminate in different directions so that you won't see a combined colour through the affected silicon pads later. For the extra row/column and shift button I took red as "colour 1", and blue as "colour 2" again. Edited 3 Oct 2015 by TK. Discussing with TK. the optimal slider value would be 5k. The MOQ of PTL45-10(X)0-502B2 is 750 pieces but I've asked Mouser if they would stock them. Sadly they don't seem to be readily available from other suppliers. 50k and 1k are available in 10mm shaft. Might a good solution then be to order the 50k version then solder a 5k6 resistor in parallel to make about 5k? In general does this technique give satisfactory (i.e. noise-free) ADC in the PIC? what is the total consumption of BLM? we agree that is 20mA leds!? You can (and should) wait to put the sliders in last. I suggest holding off until your case arrives, place them in without soldering, then see if you're happy with the length. 10k works just fine and is the value recommended for AIN (but apparently 5k is better). Let's wait until TK. chimes in with his knowledge. 20mA is the max for each LED, but they are running through a scan matrix. So it's more like 2 mA per LED. A beefy PSU is recommended, you could consider a switching 5V regulator in place of the 7805. Yes, all PCBs were shipped together on the 25th of September. Cases are coming direct to you from the manufacturer from mid-next week. EDIT: DHL tracking shows successful delivery as of 05.10.2015, 12:57 pm. 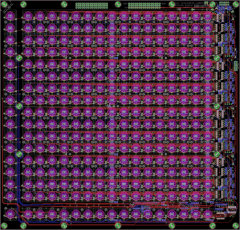 So you just stack the diode on top of the transistor? No problem! Yep, the pinout is just what we need to stack the diode on top. Pin 3 to the bottom right is NC for the BAT54 in this package, so you can connect it or not. Better than trying to jury rig a through hole one I figure. 50k and 1k are available in 10mm shaft. Might a good solution then be to order the 50k version then solder a 5k6 resistor in parallel to make about 5k? This won't work, because this way you will create a non-linear resistor network. Is the 1k too low? Andy, some bicolor led in smd package could work in this design? it could save buck and time. A new BLM has Been Bugged! Can happen. Start with the R1 bridge, you may have a small short if you scratched some soldermask off. 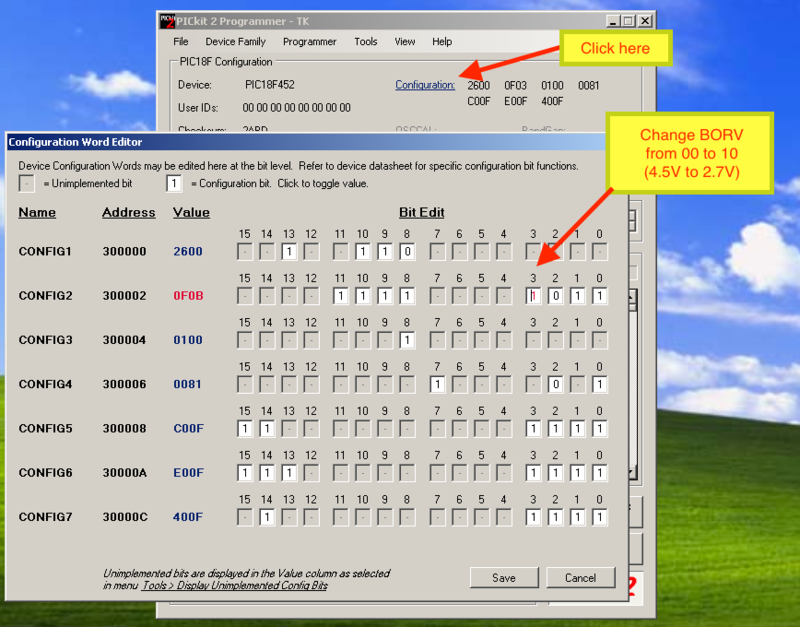 Check every cap/ pins for 5V and pin 16 of the 10k resistor networks. it could be a bad IC.